Stinging nettles aren’t just for stumbling into with painful consequences. We’ll show you how to use the leaves safely to make a delicious and super healthy nettle risotto. Flavored with green garlic and Taleggio cheese, this is a knock-out Spring dinner. But don’t worry if you don’t have nettles and green garlic, you can make it with spinach and regular garlic too! 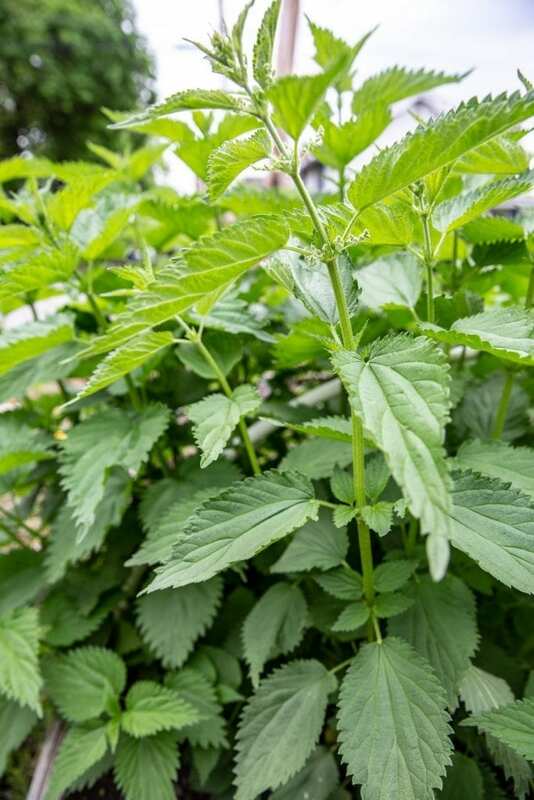 As a kid growing up in a vaguely-rural part of England, I quickly learned that if there was one plant that resisted your attempts to live peacefully with nature, it was the stinging nettle. Wherever it was most fun to run around in the woods, that’s where they lurked. If there was a perfectly tempting blackberry bramble by the side of the road, you could bet your last Rolo that there’d be a patch of nettles right in front of it. Children and nettles existed in a sort of uneasy symbiosis. We would fall into them, and they would sting us … actually, that’s not really a symbiosis, is it, it’s just how both nettles and children tend to work. We were always encouraged to grasp the nettle! (meaning, just go for it, and it probably wouldn’t sting you, which was a lie). I wonder if many childhoods would have been changed for the better if we’d been encouraged to eat the nettle instead. I think we’ve mentioned in the past on this blog that neither of us is a natural forager. We just don’t have the keen eyesight, the reserves of patience that are required, or much of a willingness to eat an occasional bug. So we live vicariously through our many skillful friends and neighbors who have the ability to spot a morel at twenty paces and can effortlessly convert a handful of dandelions into a delicious lunch. And it’s a curious fact that nettles, at least in the Northeast, just don’t seem to grow wild with as much ubiquity as in the UK. Fortunately Hudson Valley Seed Co. sells packets of nettle seeds with which we filled a bed last year, and we’re now in the second year of growing them. So we can’t exactly claim that we foraged for our dinner, but if you have an accidental nettle patch, you just might be able to. Urtica dioica, to give the common nettle its proper botanical Latin, has been used in cooking since at least the 10th century (it was recorded in Anglo-Saxon times as one of the essential Nine Herbs). It’s chock-full of fatty acids and vitamins and is apparently (and I was not aware of this word, but it’s now one of my absolute favorites) a galactagogue. If you’ve read a few food blogs, your suspicions may be raised when we start off by describing how healthy nettles are, since that kind of crunchy diversion strategy usually means the plant doesn’t taste particularly good, but in this case there’s nothing to worry about. Cooked nettles have a subtle flavor akin to spinach and kelp. Some well-known favorite recipes are in pesto, dried as a tea, or made into beer. This week, we’ve chosen to make nettle risotto. 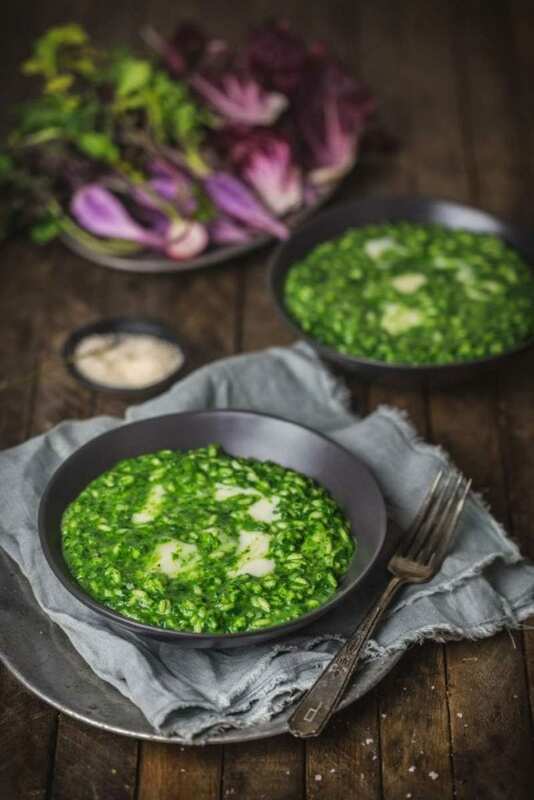 We also have garlic coming up – not fully grown and ready to harvest bulbs, but at a perfect stage for green garlic – so we decided to double our money and combine the two: Nettle Risotto with Green Garlic and Taleggio. Note: this nettle risotto recipe is equally delicious (though admittedly less brave) if you use spinach in place of the nettles. Large curly spinach will give you the best flavor, but baby and even frozen work in a pinch. You can also use regular garlic cloves in place of the green garlic, but just use 2 to 3 cloves. Green garlic is very mild, which is why we used a full 1/4 cup. Green (young) garlic is often ready to harvest at the same time as nettles. A couple of warnings before we start. 1. It’s important to harvest nettle leaves on the early side, before its seeds set in. This is partly for flavor, but older plants can also produce an irritant which can bother the digestive and urinary system. So pick ’em small. And 2. Stinging nettles do indeed sting. I would like to say that no nerds were hurt in the making of this recipe, but that would be a bit of a lie. Wear gloves when picking and preparing them. Once you blanch the leaves, the sting will disappear and they will be safe to handle and consume. If you do happen to fall into a nettle patch – as happened when we were on holiday in Scotland and a wild turkey leapt at Matt’s trouser leg, startling Emily to such an extent that she leapt backwards into a big pile o’ stingers – you could try rubbing a dock leaf on the stings, or have a tube of Benadryl handy. So onto tastier subjects! 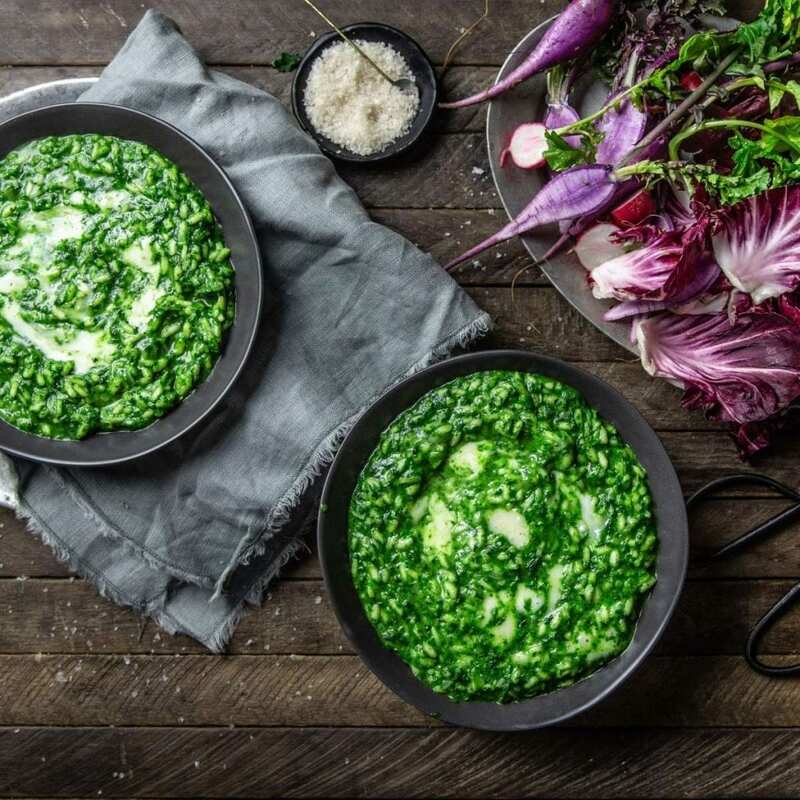 Our nettle risotto recipe was inspired by a version by Melissa Clark for the New York Times, which itself was inspired by the classic nettle risotto served at River Café in London. We obviously used nettles, but Melissa used a combination of spinach and chicory. Really any hearty green would work her: kale, Swiss chard, dandelion. Use what you have and feel free to mix and match. 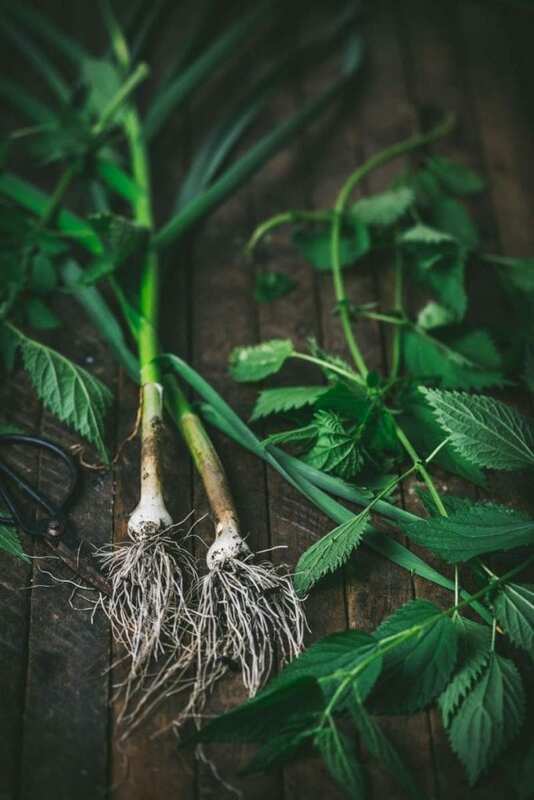 Prepare the nettle leaves as per the recipe below – using tongs to handle, blanch the leaves in boiling salted water for just a minute or two, scoop them straight into ice water, then squeeze out the water and process with a little olive oil until it looks like pesto. Set aside until the rice is cooked. As with other dark greens like chard and spinach, you’ll end up with a much smaller mass of cooked leaves, but don’t be dismayed. That modest amount of nettle will punch above its weight to provide flavor and a wallop of beautiful green color to the rice. The third main element in the recipe is taleggio cheese. This may look unassuming, but packs a lot of earthy, briny flavor. We love it in this risotto because it melts easily and gives the rice a gorgeous creamy texture. You could substitute it with fontina, or even ripe runny brie or camembert. Soft cheeses such as this can be difficult to work with when they’re warm, so cut it into cubes while it’s cold from the refrigerator, and then let it warm to room temperature while you cook the rice. We prepare the risotto rice (carnaroli is our preference, but arborio is fine too) with a flavor base that we use all the time: yellow onion, garlic (this time in the form of the green garlic), white wine, and either vegetable or chicken stock. Even if we didn’t add ANY other ingredients, these would produce a risotto worthy of eating by itself. In fact, this is more or less the same starting point we use for Mushroom Risotto with Crispy Sage and Sausage, Leek Risotto, and so on. Once it’s cooked al dente (just until there’s a little bite left in the rice), stir the pureed nettles in along with the cubed taleggio. And serve immediately! We had our nettle risotto with a side salad of spicy radish and bitter radicchio leaves, both of which are available at the farmers’ market right now. It’s like a bowlful of spring … without the sting. Trim the rind off the cheese while it’s cold and discard. Dice the cheese into ½-inch cubes. Set aside at room temperature while you prepare the risotto. Bring five quarts of salted water to a boil in a large pot. Prepare another large bowl with ice water. 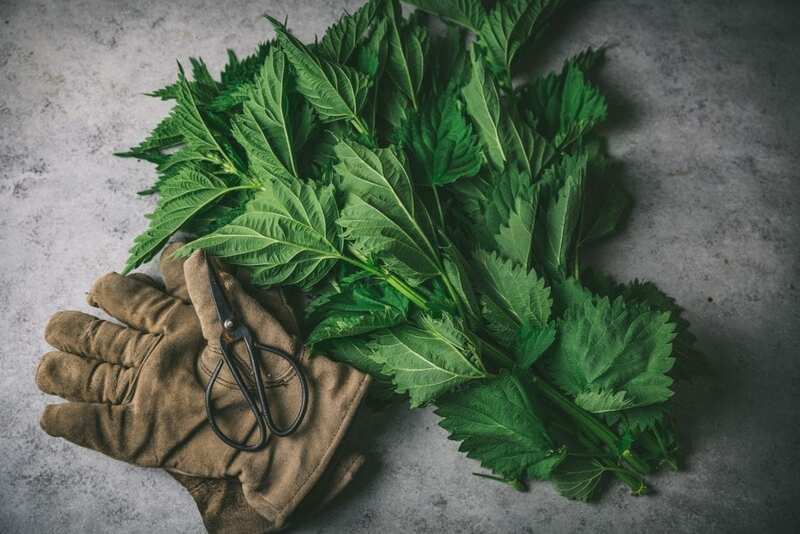 Using gloves, strip the leaves from the picked nettles and discard any stalks or seeds (although you want to pick before seed stage: see note in article). Give the leaves a rinse to remove any dirt and then add leaves to the boiling water. Blanch until fully wilted, about 1 to 2 minutes. Using tongs or a slotted spoon, remove the leaves and transfer them immediately into the ice water. Stir them gently (you can use your hands at this stage) until cool, then drain in a colander. Squeeze the leaves with your hands to remove as much liquid as you can. You may notice a slight slimy, kelpy texture - this is normal! Note: Follow the same directions for spinach (though no gloves are needed). Transfer nettles to a food processor along with 1 tablespoon olive oil and pulse until greens are mostly smooth, like pesto, about 10 to 12 pulses. You’ll end up with about 1 cup of purée. Set aside. Heat stock in a saucepan until simmering, reduce heat to low and keep warm. Melt 5 tablespoons butter in a large, high-sided skillet over medium heat. Stir in onion, garlic and salt and cook until translucent but not brown, about 7 minutes. Stir in rice, and toss until it’s well coated in butter. Cook until the edges of the rice looks a little translucent and it smells toasted, about 5 minutes. Stir in wine and cook until it’s absorbed, about 3 minutes. Stir in hot stock, about 1 cup at a time, stirring often but not constantly, until the rice is cooked through but not mushy, 15 to 20 minutes. You may have some stock left over. If more liquid is needed, you can add some hot water. Stir in nettle purée until combined. Add cubed taleggio and stir to melt, leaving streaks of cheese. Season to taste with salt and pepper. Serve immediately. Yes!! Finally, a recipe with nettles. My grandma used them to make stew as well.